Immerse yourself in a world as seen through the eyes of a small but slightly self-important miniature poodle, and his humorous insights, experiences, and foibles while adopting and training his new owners... all based on a real-life dog and the family he cares for. CLICK HERE to go to Amazon.com to preview or purchase "A Little Dog's Tale"
With that as a backdrop, as a surprise for my father's 80'th birthday, I presented him with this book of stories written through the eyes of Sweetie Pie and Sweetie Pie's perspective of having adopted Gil and Marian as his own. 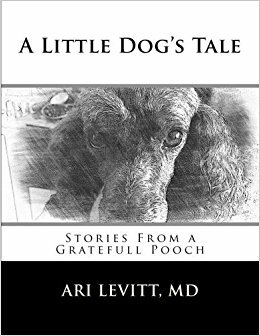 While the stories are specific to this particular little dog, I do believe the sentiments and experiences described in his narrative can be considered fairly universal to any dog owner, which is why, at the request of my father and Marian, I am making them available to all here on Amazon. Sweetie Pie's Favorite Catch Phrases ... and MORE! Below, I am including two excerpts from the book for you to peruse. If you enjoy these, there are many for you to explore in the book. Enjoy! I want to tell you something that I haven’t told anyone else. Recently I’ve been experiencing some very vivid, very memorable dreams in which the same recurring theme keeps coming up. In each of these, I’m being interviewed by a jury of the greatest of my peers — there’s Rin Tin Tin, Lassie, Cujo, Benji, The Shaggy Dog, Petey, Toto, both Lady & the Tramp, and numerous others that may or may not appear, depending on the slightly varying versions of the dream. And in each case I’m being asked only one thing. And that is: what do I think has been the crowning achievement of my relatively short four years of ‘life-of-service’ on this planet? But there’s nothing for them to hear. Until, finally, one of the esteemed quadrupedal panelists becomes suddenly distracted by a squirrel (or a cat, or something equally furry), breaks ranks, and then all sorts of mayhem ensues…. …which is usually when I wake up. But on those nights when I go to bed fairly well-rested and in a good frame of mind, when I’ve been fed the ‘good’ kibble, when I’ve been taken out early for walks and piddles…. on those nights I know exactly what to say. And I say it honestly, and with all the unconditional love my little heart can muster. I say that I saved a life. And what makes it even more noteworthy is this: that I did it in the most noble and genial of ways imaginable. Because the people whose lives I saved, thought they were saving mine….. I know I’ve said a lot of this before, but I think it’s worth repeating. I’ve noticed that when I’m around them, my two sweeties smile and babble and coo at me and at each other, and well — there’s no other way to say it — they behave a lot like puppies. It’s a common medical condition. Little dogs bring out the inner puppy in their trainees. It’s true. Cute little canine coaches like ‘moi’ have a kind of transference affect on their trainees. And this is really nice to see. This transference ability — this effect, this gift — is definitely not a quality you’d expect to find in all dog breeds (least of all the big dogs. Definitely not Great Danes), just the small, cute, little poodle dogs like me. I can’t help it. It just happens. I don’t even try. What we’re talking about is…. well, it’s a little hard to pin down. …the things that you see through your dogs eyes… you have to let all of that get under your skin just a little bit — like a tiny, little, living, breathing splinter of happy, carefree joy — and stay there for a while, growing and multiplying, until these little shards of bliss mature into a regular daily part of who you are. And they change you. Necessarily. They change how you see the world. They change how you live your life. And you become happier …and more carefree. Like your dog. … all of this will blossom into a very special kind of joy. Again, it’s little hard to describe. I don’t know if I can do it justice. It’s not the adrenalin-rushing joy of thrill that comes with skiing the black diamond, or mountain biking the Alps, or bungee jumping the Royal Gorge. This is a joy that is uniquely shared by dog and human. It’s a joy that comes through an invisible bond, a connection between two sacred beings — beings of different shape and form, genus and species, but beings who also both know, that without this connection, their world, their lives, and the meaning of their daily rituals would be that much the less. This is a joy that marinates, not pops. and it comes from trust. It’s a crack in the firmament — a release from the mundane and serious concerns of adulthood that have through the years, slowly, indolently, scabbed, calloused, and blanketed over the romping, giggling, carefree puppyhood of our earliest, most primitive selves. “You may cry ‘Havoc!’ and let slip the dogs of war! …I think the last part of that might have been edited out later, I can’t be sure, but no matter. The important thing is that, even though Shakespeare himself never owned a ‘real’ dog (just a corgi), what he says about poodles is so true! It’s as true today as it was in Shakespeare’s time, and I really believe it! If there were more cute little poodles like me in the world, I think there would be a lot less wars, a lot less strife, a lot less anxiety … and, lets face it, a lot cleaner noses. And the reason is this, simple and plain. It’s because only in those brief moments of intimate interaction with your dog — where play and cuddles and licking and tickling and silliness abound — can the burdens of all our yesteryears dissolve, can our adultish cares and worries be momentarily cast aside, can the weight of the world be forgotten and the levity of peace & joy effuse and abide, and can we once again become the children we forgot we once were and rediscover a kind of joy that we forgot we once had. This is the kind of joy I’m talking about. And it’s this kind of innocent childhood joy that I’ve seen bubbling up again and again in my two sweeties. I call this particular brand of pooch-inspired joy “puppy-joy”. And without me — the cutest, the sweetest, the cuddliest little critter in their corner of the kennel, licking their noses and doing my happy dance — I doubt that there would be much puppy-joy in their lives at all. And without them, there would definitely be little in mine.